The third box we shipped from Yakushima has just arrived to our Los Angeles home today. The arrival of the package conjunction to days after days I am spending to launch KURUMA series... reminded me how special this island was. Everything was so raw... yet pure. I moved so frequently throughout my life and I never developed much of sentiment to a "place" before... so it feels amazingly lucky to have found a place where I can feel so much connection with... even though our time there feels like a dream now. p.s. 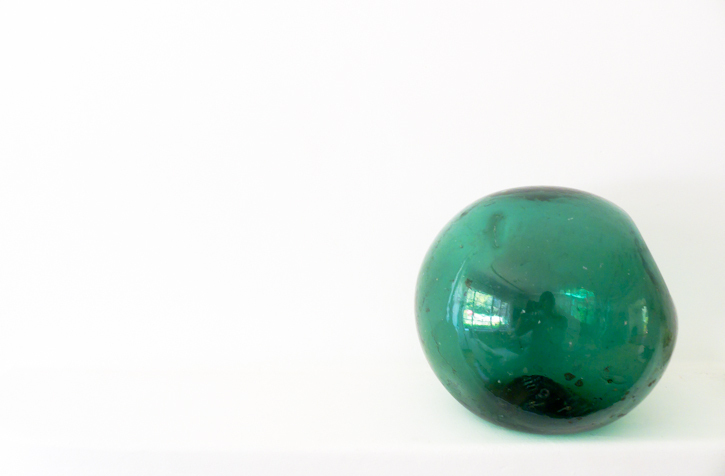 One of the contents in the box was this beautiful glass orb (which used to be a buoy for fishing ship). We saw them everywhere on the island (at home, park and places like this) but everyone said that they no longer found them drifted on the beach. One day we were exploring a very quiet beach and we came across one all tangled up in the seaweed... there was no hesitation and we took it home. We weren't sure if it would make the rough trip from Japan to Los Angeles via sea... but we did our best to wrap it in layers. Today it has arrived with other goodies in the box... it feels so nice to have a piece of the island at home.